It is back to school season and stores have been ready with their sales and marketing ploys since June. 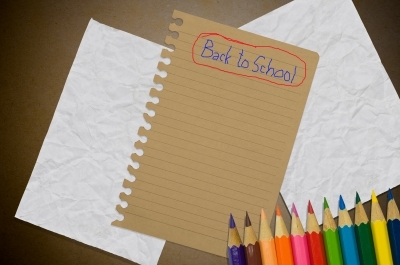 Now that most people have stocked up on back to school supplies here are a couple of other tips that parents should keep in mind in order to get their kids ready this year. 1. Make sure that your child knows when school is starting. Surprising your child the day before can be unnerving and upsetting. It is best to have a conversation with your kid letting him or her know your expectations and how you want this school year to work out. All advice should be given in love. 2. If possible, attend an open house. The worse thing about a new school year is that it is new. New teachers, new students, and new friends. All of this “newness” can be scary for a child. An open house will help ease those fears because students will be able to address their fears by making friends, meeting their teachers, and by knowing with their classes will be held. Making it to school on time. Preparing their clothes, homework, and lunches the night before. Asking questions in class when he or she doesn’t understand something. Sharing with an adult he or she can trust if there is something going on that is questionable or of concern. Planning to make good grades such as straight A’s. Planning to learn a new skill or talent. 4. Take note of your child’s interest, if he or she has special skills that need to be developed look into local programs such as after school or weekend activities. 5. Make sure your child is emotionally ready for school. Find out what fears he or she may have and immediately start looking into ways to lessen those fears. 6. Get your child ready by making sure their physical is up-to-date. Schedule appointments with your pediatrician, dentist, and optometrist. Below is a video from Transitions Optical, Inc. that shows their commitment to help students get ready for this school year. 7. Have a plan on how you will encourage your child this school year. More than anything else your child needs to know that you think he or she is fantastic, but there is always room for improvement. 8. Start planning menus for breakfast, lunch, and dinner. Make sure the meals are well-balanced and full of fresh produce. 9. Mention the importance of cleanliness to your child, which includes washing hands, keeping up good hygiene, and not sharing food with others. 10. Also talk to your doctor about implementing vitamins into your child’s diet. Some vitamins may be needed and some may not, but it is important to at least check because a good multivitamin can help keep your child’s immune system strong. About Eye Didn’t Know That! Transitions Optical created the Eye Didn’t Know That! program to help people of all ages learn more about healthy vision. The program was developed by a team that includes eyecare professionals, science and education experts, and Transitions Optical, Inc. The Eye Didn’t Know That! website offers materials for children, parents, teachers and eyecare professionals to use to teach and learn more about eyecare basics and the importance of eye health and regular comprehensive eye exams. The information includes fact sheets, games, quizzes, lesson plans and free downloadable materials. 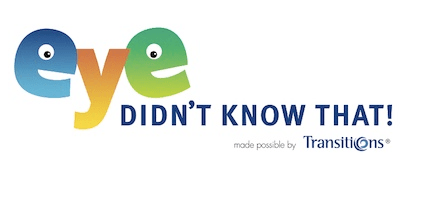 To learn more and to find out what makes your friends and family say “Eye Didn’t Know That!” visit www.eyedidntknowthat.com.